This period sees the expansion of farming and the first use of iron for tools and weapons. By the end of the Iron Age most of the original natural forest has been cleared and animals like wolves, bears and aurochs (wild cattle) are either extinct or have become rare. Large numbers of farmsteads of this period have been recorded from the chalklands of Hampshire, but none are known in the immediate vicinity of Bordon and Whitehill. They must have existed however, as Walldown is probably an Iron Age hillfort established to control and to provide protection for the local population. 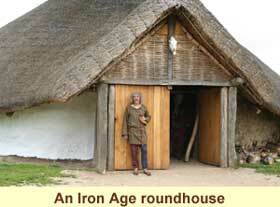 People lived in roundhouses, some of which had the same floor area as a modern detached house. Towards the end of the period coinage was introduced into Britain and trade with the Roman world increased. More general information about this period can be found below the map. Attempts to understand the human behaviour of the period have traditionally focused on the geographic position of the islands and their landscape, along with the channels of influence coming from continental Europe. During the later Bronze Age there are indications of new ideas influencing land use and settlement. Extensive field systems, now called Celtic fields, were being set out and settlements were becoming more permanent and focused on better exploitation of the land. The central organisation to undertake this had been present since the Neolithic period but it was now targeted at economic and social goals, such as taming the landscape rather than the building of large ceremonial structures like Stonehenge. Long ditches, some many miles in length, were dug with enclosures placed at their ends. These are thought to indicate territorial borders and a desire to increase control over wide areas. By the 8th century BC, there is increasing evidence of Great Britain becoming closely tied to continental Europe, especially in Britain's South and East. New weapon types appeared with clear parallels to those on the continent such as the Carp's tongue sword, complex examples of which are found all over Atlantic Europe. Phoenician traders probably began visiting Great Britain in search of minerals around this time, bringing with them goods from the Mediterranean. At the same time, Northern European artefact types reached Eastern Great Britain in large quantities from across the North Sea. Within this context, the climate became considerably wetter, forcing Bronze Age farmsteads that had grown on lowland areas to relocate to upland sites. Defensive structures dating from this time are often impressive, for example the brochs of Northern Scotland and the hill forts that dotted the rest of the islands. Some of the most well-known hill forts include Maiden Castle, Dorset, Cadbury Castle, Somerset and Danebury, Hampshire. Hill forts first appeared in Wessex in the Late Bronze Age, but only become common in the period between 550 and 400 BC. The earliest were of a simple univallate form, and often connected with earlier enclosures attached to the long ditch systems. 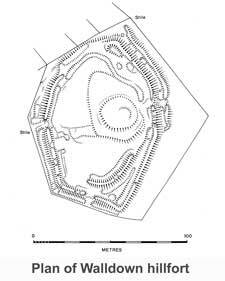 Few hill forts have been substantially excavated in the modern era, Danebury being a notable exception, with 49% of its total surface area studied. However, it appears that these "forts" were also used for domestic purposes, with examples of food storage, industry and occupation being found within their earthworks. On the other hand, they may have been only occupied intermittently as it is difficult to reconcile permanently occupied hill forts with the lowland farmsteads and their roundhouses found during the 20th century, such as at Little Woodbury and Rispain Camp. Many hill forts are not in fact "forts" at all, and demonstrate little or no evidence of occupation. The development of hill forts may have occurred due to greater tensions that arose between the better structured and more populous social groups. 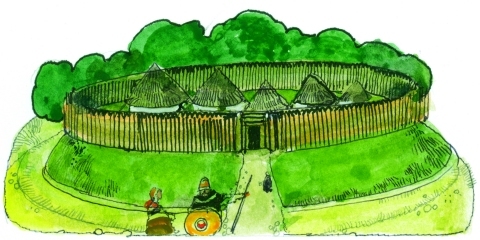 Alternatively, there are suggestions that, in the latter phases of the Iron Age, these structures simply indicate a greater accumulation of wealth and a higher standard of living, although any such shift is invisible in the archaeological record for the Middle Iron Age, when hill forts come into their own. In this regard, they may have served as wider centres used for markets and social contact. Either way, during the Roman occupation the evidence suggests that, as defensive structures, they proved to be of little use against concerted Roman attack. Suetonius comments that Vespasian captured more than twenty "towns" during a campaign in the West Country in 43 AD, and there is some evidence of violence from the hill forts of Hod Hill and Maiden Castle in Dorset from this period. Some hill forts continued as settlements for the newly conquered Britons. Some were also reused by later cultures, such as the Saxons, in the early Medieval period. The Roman historian Tacitus suggested that the Britons were descended from people who had arrived from the continent, comparing the Caledonians (in modern-day Scotland) to their Germanic neighbours; the Silures of Southern Wales to Iberian settlers; and the inhabitants of Southeast Britannia to Gaulish tribes. This migrationist view long informed later views of the origins of the British Iron Age and, indeed, the making of the modern nations. Linguistic evidence inferred from the surviving Celtic languages in Northern and Western Great Britain at first appeared to support this idea, and the changes in material culture which archaeologists observed during later prehistory were routinely ascribed to a new wave of invaders. From the early 20th century, this "invasionist" scenario was juxtaposed to a diffusionist view. By the 1960s, this latter model seemed to have gained mainstream support, but it came in turn under attack in the 1970s. There was certainly a large migration of people from Central Europe westwards during the early Iron Age. The question whether these movements should be described as "invasions", or as mere "migrations", or as mostly "diffusion" is largely a semantic one. There are examples of events which could be labelled "invasions", such as the arrival in Southern Britain of the Belgae from the end of the 2nd century BC as described in Caesar's Commentaries on the Gallic War, although such sudden events may be invisible in the archaeological record, principally depending, in this case, on the interpretation of Aylesford-Swarling pottery. Regardless of the "invasionist" vs. "diffusionist" debate, it is beyond dispute that exchanges with the continent were a defining aspect of the British Iron Age. According to Julius Caesar, the Britons further inland than the Belgae believed that they were indigenous. Population estimates vary but the number of people in Iron Age Great Britain could have been three or four million by the first century BC, with most concentrated densely in the agricultural lands of the South. Settlement density and a land shortage may have contributed to rising tensions during the period. The population pyramid for Iron Age Britain would have been a classic pyramid in shape, with no significant number of people older than fifty years. The average life expectancy at birth would have been around 25, but at the age of five it would have been around 30. These figures would be slightly lower for women, and slightly higher for men throughout the Middle Iron Age in most areas, on account of the high mortality rate of young women during childbirth; however, the average age for the two sexes would be roughly equal for the Late Iron Age. This interpretation depends on the view that warfare and social strife increased in the Late Iron Age, which seems to be fairly well attested in the archaeological record, for Southern Britain at least. Early in the Iron Age, the widespread Wessex pottery of Southern Britain, such as the type style from All Cannings Cross, may suggest a consolidated socio-economic group in the region. However, by 600 BC this appears to have broken down into differing sub-groups with their own pottery styles. Between c. 400 and 100 BC there is evidence of emerging regional identities and a significant population increase. Claudius Ptolemy described Britain at the beginning of Roman rule but incorporated material from earlier sources. Although the name "Pretanic Isles" had been known since the voyage of Pytheas and "Britannia" was in use by Strabo and Pliny, Ptolemy used the earlier "Albion," known to have been used as early as the Massaliote Periplus. The Romans described a variety of deities worshipped by the people of Northwestern Europe. Barry Cunliffe perceives a division between one group of gods relating to masculinity, the sky and individual tribes and a second group of goddesses relating to associations with fertility, the earth and a universality that transcended tribal differences. Wells and springs had female, divine links exemplified by the goddess Sulis worshipped at Bath. In Tacitus' Agricola (2.21), he notes the similarity between both religious and ritual practices of the pre-Roman British and the Gauls. Religious practices revolved around offerings and sacrifices, sometimes human but more often involving the ritual slaughter of animals or the deposition of metalwork, especially war booty. Weapons and horse trappings have been found in the bog at Llyn Cerrig Bach on Anglesey and are interpreted as votive offerings cast into a lake. Numerous weapons have also been recovered from rivers, especially the Thames, but also the Trent and Tyne. Some buried hoards of jewellery are interpreted as gifts to the earth gods. Disused grain storage pits and the ends of ditches have also produced what appear to be deliberately placed deposits, including a preference for burials of horses, dogs and ravens. The bodies were often mutilated and some human finds at the bottom of pits, such as those found at Danebury, may have had a ritual aspect. Caesar's texts tell us that the priests of Britain were Druids, a religious elite with considerable holy and secular powers. Great Britain appears to have been the seat of the Druidic religion and Tacitus' account of the later raid on Anglesey led by Suetonius Paulinus gives some indication of its nature. No archaeological evidence survives of Druidry, although a number of burials made with ritual trappings and found in Kent may suggest a religious character to the subjects. Overall, the traditional view is that religion was practised in natural settings in the open air. However, several sites interpreted as Iron Age shrines seem to contradict this view which may derive from Victorian and later Celtic romanticism. Sites such as at Hayling Island in Hampshire and that found during construction work at Heathrow airport are interpreted as purpose-built shrines. The Hayling Island example was a circular wooden building set within a rectangular precinct and was rebuilt in stone as a Romano-British temple in the 1st century AD to the same plan. The Heathrow temple was a small cella surrounded by a ring of postholes thought to have formed an ambulatory which is very similar to Romano-Celtic temples found elsewhere in Europe. A rectangular structure at Danebury and a sequence of six-poster structures overlooking calf burials and culminating in a trench-founded rectangular structure at Cadbury Castle, Somerset, have been similarly interpreted. An example at Sigwells, overlooking Cadbury Castle, was associated with metalwork and whole and partial animal burials to its east. However, evidence of an open air shrine was found at Hallaton, Leicestershire. Here, a collection of objects known as the Hallaton Treasure were buried in a ditch in the early 1st century AD. 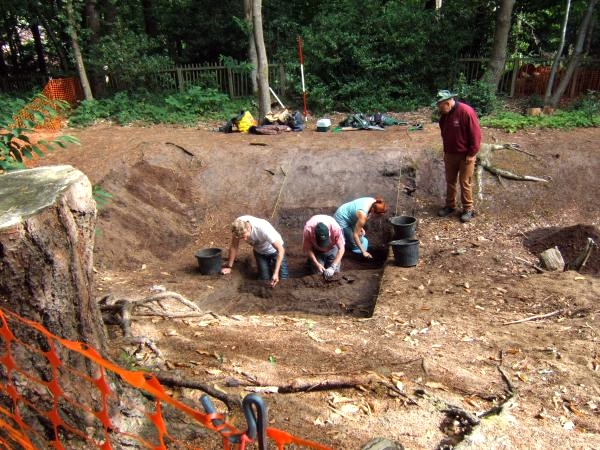 The only structural evidence was a wooden palisade built in the ditch. Death in Iron Age Great Britain seems to have produced different behaviours in different regions. Cremation was a common method of disposing of the dead, although the chariot burials and other inhumations of the Arras culture of East Yorkshire, and the cist burials of Cornwall, demonstrate that it was not ubiquitous. In fact, the general dearth of excavated Iron Age burials makes drawing conclusions difficult. Excarnation has been suggested as a reason for the lack of burial evidence with the remains of the dead being dispersed either naturally or through human agency. Trade links developed in the Bronze Age and beforehand provided Great Britain with numerous examples of continental craftsmanship. Swords especially were imported, copied and often improved upon by the natives. Early in the period, Hallstatt slashing swords and daggers were a significant import although, by the mid 6th century, the volume of goods arriving seems to have declined, possibly due to more profitable trade centres appearing in the Mediterranean. La Tene culture items (usually associated with the Celts) appeared in later centuries and, again, these were adopted and adapted with alacrity by the locals. 1.) Steady Transition; the development of iron parallel to a diminishing bronze system. 2.) Rapid Abandonment; iron undermines bronze and takes over its social function. 3.) Bronze Crisis; severe reduction in the supply of bronze allows the iron to replace it. With regard to animal husbandry, cattle represented a significant investment in pre-Roman Britain as they could be used as a source of portable wealth, as well as providing useful domestic by-products such as milk, cheese and leather. In the Later Iron Age, an apparent shift is visible, revealing a change in dominance from cattle rearing to that of sheep. Economically, sheep are significantly less labour-intensive, requiring fewer people per animal. Whilst cattle and sheep dominate the osteo-archaeological record, evidence for pig, ox, dog and, rarely, chicken is widely represented. Interestingly, there is generally an absence from environmental remains of hunted game and wild species as well as fresh and sea water species, even in coastal communities. A key commodity of the Iron Age was salt, used for preservation and the supplementation of diet. Whilst difficult to find archaeologically, some evidence does exist. Salterns, in which sea water was boiled to produce salt, are prevalent in the East Anglia fenlands. Additionally, Morris notes that some salt trading networks spanned over 75 km. Representing an important political and economic medium, the vast number of Iron Age coins found in Great Britain are of great archaeological value. Some, such as gold staters, were imported from mainland Europe. Others, such as the cast bronze (potin) coins of Southeast England, are clearly influenced by Roman originals. The British tribal kings also adopted the continental habit of putting their names on the coins they had minted, with such examples as Tasciovanus from Verulamium and Cunobelinos from Camelodunum identifying regional differentiation. Hoards of Iron Age coins include the Silsden Hoard in West Yorkshire found in 1998. A large collection of coins, known as the Hallaton Treasure, was found at a Late Iron Age shrine near Hallaton, Leicestershire in 2000 and consisted of 5294 coins, mostly attributed to the Corieltavi tribe. These were buried in 14 separate hoards over several decades in the early 1st century AD. The expansion of the economy throughout the period, but especially in the later Iron Age, is in large part a reflection of key changes in the expression of social and economic status. The Early Iron Age saw a substantial number of goods belonging to the Hallstatt culture imported from the continent, and these came to have a major effect on Middle Iron Age native art. However, throughout most of the Middle Iron Age, trade with the continent basically dried up; there is no evidence for large-scale commerce whatsoever, which must have been as a result of the social circumstances in Southern Britain at the time: trade brought wealth to a small group, and wealth brought power. Thus it was avoided among the egalitarian tribes of the Middle Iron Age of the hillfort zone. From the late 2nd century BC onwards South-central Britain was indirectly linked into Roman trading networks via Brittany and the Atlantic seaways to southwest France. Hengistbury Head in Dorset was the most important trading site and large quantities of Italian wine amphorae have been found there. These Atlantic trade networks were heavily disrupted following Julius Caesar's conquest of Brittany in the 50s BC. This fact may support a supposition that the Celts of Britain had an economic interest in supporting their Gallic brethren in their resistance to Roman occupation. In Southeast Britain, meanwhile, extensive contact with the 'Belgic' tribes of Northern France is evidenced by large numbers of imported Gallo-Belgic gold coins between the mid-2nd century BC and Caesar's conquest of Gaul in the 50s BC. These coins probably did not principally move through trade. In the past, the emigration of Belgic peoples to Southeast Britain has been cited as an explanation for their appearance in that region. However, recent work suggests that their presence in Southeast Britain may have occurred due to a kind of political and social patronage that was paid by the North French groups in exchange for obtaining aid from their British counterparts in their warfare with the Romans on the Continent. After Caesar's conquest of Gaul, a thriving trade developed between Southeast Britain and the near Continent. This is archaeologically evidenced through imports of wine and olive oil amphorae and mass-produced Gallo-Belgic pottery. Strabo, writing in the early 1st century AD, lists ivory chains and necklaces, amber gems, glass vessels, and other petty wares, as articles imported to Britain, whilst he recorded the island's exports as grain, cattle, gold, silver, iron, hides, slaves and hunting dogs. This trade probably thrived as a result of political links and client kingship relationships that developed between groups in Southeast Britain and the Roman world. Historically speaking, the Iron Age in Southern Great Britain ended with the Roman invasion. Clearly the native societies were not instantaneously changed into toga-wearing, Latin-speaking provincials, though some relatively quick change is evident archaeologically. For example, the Romano-Celtic shrine in Hayling Island, Hampshire was constructed in the AD 60s - 70s, whilst Agricola was still campaigning in Northern Britain (mostly in what is now Scotland), and on top of an Iron Age ritual site. Rectilinear stone structures, indicative of a change in housing to the Roman style are visible from the mid to late 1st century AD at Brixworth and Quinton. In areas where Roman rule was not strong or was non-existent, Iron Age beliefs and practices remained, but not without at least marginal levels of Roman, or Romano-British influence. The survival of place names, such as Camulodunum (Colchester), and which derive from the native language, is evidence of this.